Our calendar is updated in real-time & our competitive nightly rates are accurately displayed. Simply enter your desired dates and click 'Book Now! 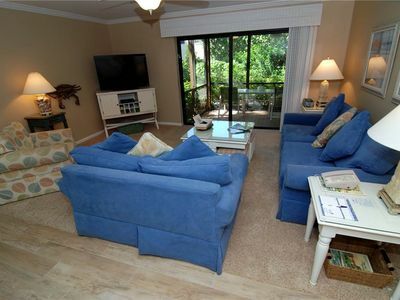 Home's Open Layout is ideal for celebrating your anniversary or for family fun. 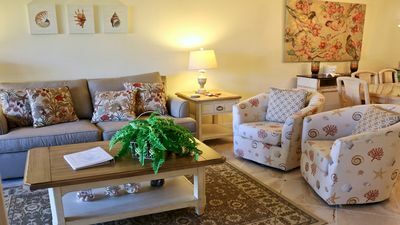 Home sleeps 6 in beds toddlers and babies do not count towards guest count. 7th can be allowed to stay with added fees. Ask for PAK - n- Play & High chair. With our PREMIER BADGE you can book with the peace of mind of being guaranteed an exceptional island vacation experience! We honor ALL bookings so Instant Book today and be on island time soon! Earliest ferry out of island is 7am in case you need to catch a flight. 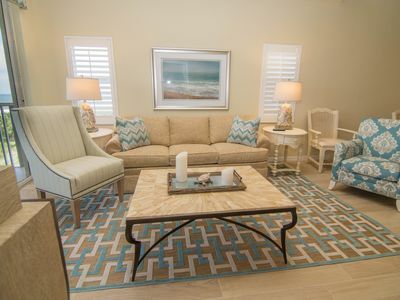 Our beach home is delightfully well kept, tastefully decorated and professionally cleaned to a higher standard. Enjoy our early check in at 2:00 pm and all the free perks of booking with us. .
FREE PERKS Of Booking with us - Complimentary Bottle of Red Wine, Complimentary Coffee (with creamer & sugar) Free linens, beach towels, bath towels, hand soap, dish washing soap, bath soap, beach toys, umbrellas, Play Station with 20 games, UNO card game, array of board games, dvd collection of movies, live streaming TV & shows. 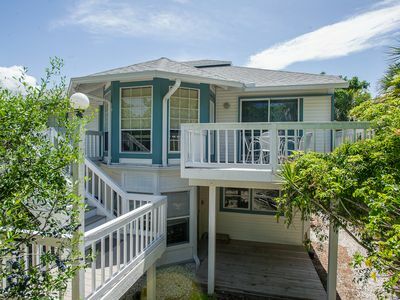 Gulf of Mexico and beautiful ocean views are 300 steps away from the beach when staying at The Little Oasis Beach House. 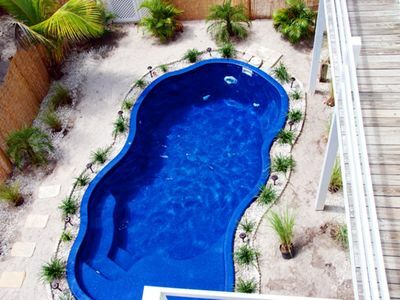 Ocean views from rooftop observation deck with 360 degree breathtaking views of North Captiva and the Nature Preserve. 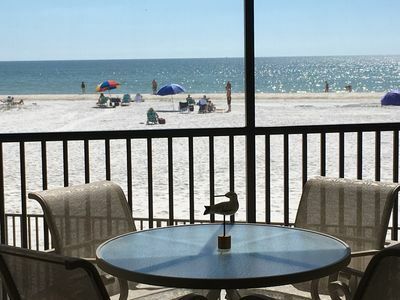 Best fishing, kayaking, and shelling in our white sandy beaches. 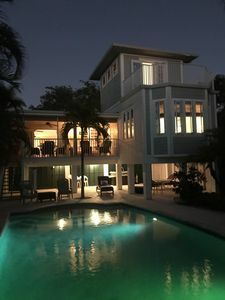 First floor includes heated outdoor pool behind privacy wooden fence and charcoal Weber grill. Hammock for afternoon siestas. Nearly two-thirds of the island’s 700 acres is a protected State Preserve and Wildlife Sanctuary, open to the public free of charge year-round. This is what so different about North Captiva. 2/3 of the island will always remain preserved and untarnished. Over 100 species of migratory birds and NO venomous snakes. Around the island waters or the Preserve, you are likely to see manatees, dolphins at play, gopher tortoises, and bald eagles, white pelicans and ospreys. At night, drive your golf cart up onto the beautifully illuminated sand path where our charging station is nestled among the trees. 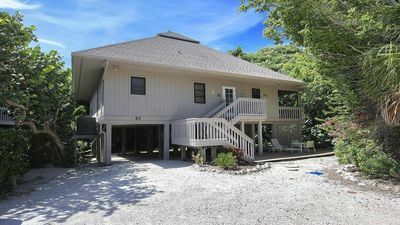 This is a VERY quiet and private location and the house is nestled in the rear of the vast lot surrounded by nature. All golf carts have LED lighting for night time dinner trips to any of the 4 waterfront restaurants on island. We have two golf carts on the property at all times one being a back up. 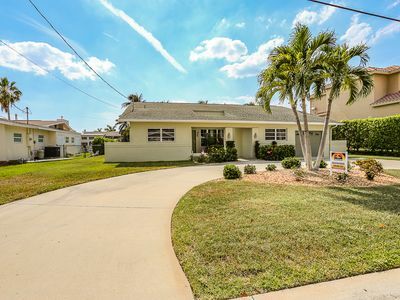 Not a lot of beach cottages on Upper Captiva have this. 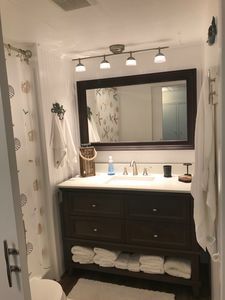 The beach house is equipped with a newer washer and dryer making it easier for those staying a week or two with us at our little piece of heaven. The home offer 2 master bedrooms same size with their own bathrooms for privacy. Walk in closet and a second spacious wall to wall closet in second for week or two stays. 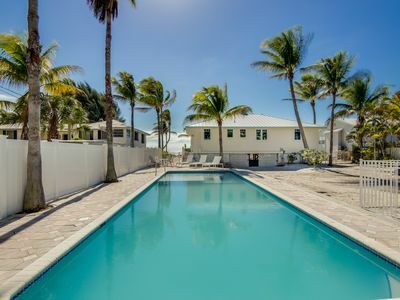 This home is located on the barrier reef island of North Captiva, remote and undiscovered resembling Old Florida where a slower pace is expected. This exclusive island paradise is accessible by ferry, private boat, or small plane, 20 minute ferry ride- the best part with beautiful scenery. White sandy beaches stretching over 3 miles, never crowded always paradisaical. A truly exclusive island vacation escape with no traffic, no bridges, no cars, no roads and with just the right amount of modern amenities. 4 restaurants and a store on island. Dock space, Jet-Skis, boats, paddle boards, kayaks available for rent on island. Sand underneath your feet the entire time you are vacationing watching the gopher tortoises pass you by and hearing nature's tunes- birds chirping. Five conveniently scheduled ferry trips daily are made to North Captiva Island and is $40/adult round trip and kids of course are less. Our 2:00pm FREE early check in time allows you to take the 1pm ferry arriving in North Captiva island by 1:30pm and start the fun sooner. We can refer a grocery service that shops for groceries and liquor and has it ready for you all put away for your consumption upon arrival. Family fishing charters and boat rentals are available on island. Best shelling in the world along with saltwater and freshwater fishing. 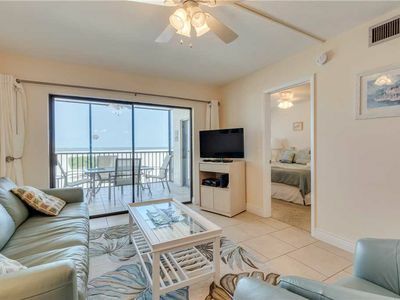 This private 2 bedroom beach house flaunts en suites for maximum privacy. Each bedroom has its own private bath. 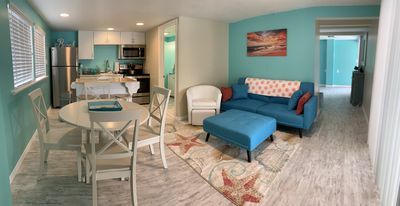 Beautifully decorated and well appointed with a fully equipped kitchen, flatscreen TV, and free wifi. 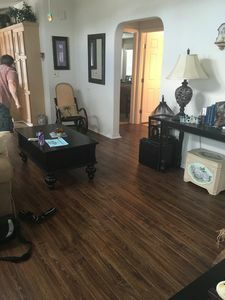 Open concept living and dining room area so you have the kiddies always in plain sight. A golf cart is provided with your rental free of charge. Seats 4 adults or 2 adults and 3 children. Second golf cart seats 4 is also available. 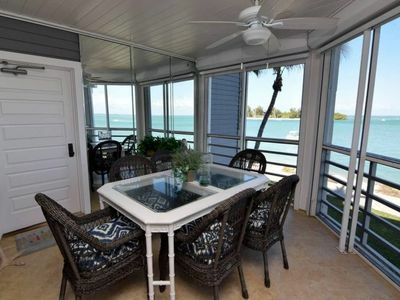 Enjoy the peace and quiet of the tucked away 500 square foot screened in deck, far from the reaches of the world, allowing you to be lost in the tropical breezes. 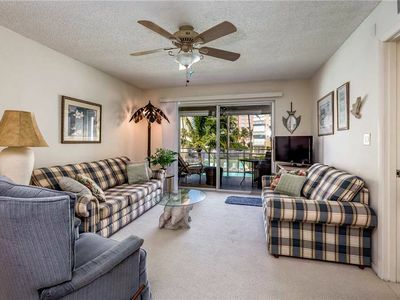 A perfect location if you are looking for a tranquil island setting with a private deck, creating a serene atmosphere that will have you relaxed in no time. 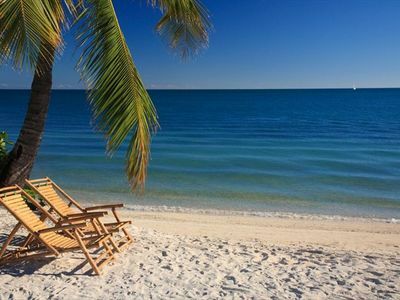 Fort Myers Airport is the nearest airport to fly into and you can catch a cab to the ferry terminal. Play Station (20 games) and Roku with live tv for those who still want to connect with the rest of the world. Nature preserve near beach house to go hiking with the entire family. 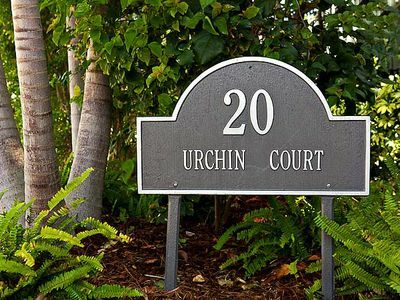 Ocean is 300 steps away or a 1 minute golf cart ride to private beach access.1 minute to club where you can enjoy first rate amenities such as kayaks. bicycles, Olympic size pools, sauna, Jacuzzi, tennis courts, access to gym with cardiovascular and weight resistance machines, a basketball court, unlimited kayak use and use of fat tire bikes. 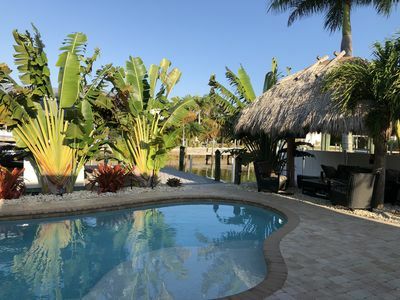 Experience the peace and serenity of The Little Oasis Beach House in North Captiva Island where your wonderful memories are our resume. Low off season rates - boat slip included if you need one! 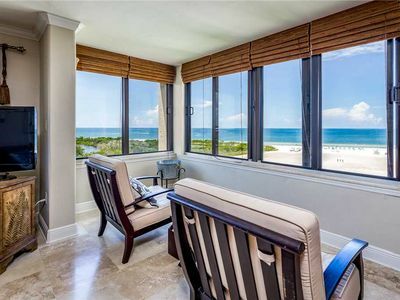 Ideally Located Sandarac Beachfront 2Bed/2Bath w/ Amazing Views! 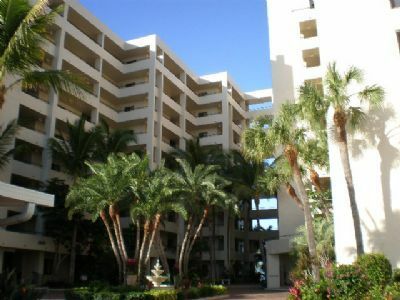 Elevator, Heated Pool!